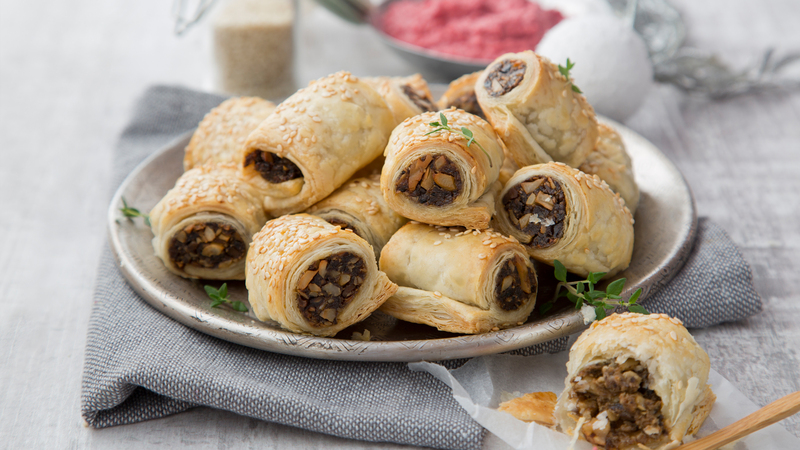 Vegan and sausage roll aren’t words that typically go together, but these go down a treat. They’re great party food and work well in lunchboxes. Everyone will be looking for more! 2. To make the sausage ‘meat’, heat the oil in a frying pan on a high heat. Add the mushrooms, garlic and salt. Cook for 4 minutes, stirring regularly, until the mushrooms have browned and wilted down significantly. Add the tamari or soy sauce and cook for a further minute. Take the pan off the heat. 3. Transfer the mushrooms to a food processor along with the cashews, cumin, smoked paprika and pepper. Blend until smooth. 4. Place one sheet of puff pastry on a cutting board and cut in half lengthwise into two rectangles. Set one aside. 5. In the middle of one of your rectangles of puff pastry, use your hands to roll half of the mushroom mix into a sausage shape about 2.5cm thick neatly covering the full length of the pastry. The sausage filling should ideally be in the middle third of the pastry sheet, leaving one-third clear on either side. Roll up the pastry to cover the sausage so that it is overlapping slightly. Now roll it towards you gently so it’s seam side down, pressing down lightly using both hands so your sausage rolls are sealed and won’t open up during cooking. 6. Use a pastry brush to brush your non-dairy milk of choice all over the pastry. Sprinkle the top with 1 tablespoon of the sesame seeds, then cut the roll into small bite-sized pieces about 4cm in length. This should give you eight sausage rolls. Place on the lined baking tray. 7. Repeat with the remaining half of the mushroom mixture on the second rectangle of the puff pastry. 8. Bake in the oven for 25 to 30 minutes, until the rolls are lovely and golden. Leave them to cool and enjoy with some Happy Pear pesto or hummus.